The platform can handle voice/SMS/data/value added/financial services rating, charging account balance updates and billing. The platform’s featured design complies with 3G and further mobile standards recommendations driven by 4G requirement. It covers session control, tariff handling and rating, as well as user accounts storage and credit control. As the final stage of the processing, it can produce multi-tenant invoices. The solution is built using a modular architecture of components that are designed to allow easy and cost-effective deployment of the BCS platform modules. Internally, it utilizes an event-based architecture enabling real-time processing of events that are passed with exceptional robustness and performance. The green elements are part of the customer’s infrastructure, the blue ones of Arevocom Billing and Customer Service platform. To ensure flexibility, externally integrated or communicating modules are interconnected via modern interfaces that allow easy, robust and fast real-time communication. This design allows us to easily interconnect additional event sources, rating components or account management components. It facilitates integration of real-time charging and payment interfaces. Internally, where no special interfacing is required, the platform elements and blocks use APIs. The set of components included in the Arevocom Charging and Customer Service platform connected with the surrounding platforms will provide an interface, process incoming usage data and online requests, and handle session control, rating, charging and billing. They also provide an interface to back-office platforms for account data query. The platform can be configured to enable VAS/Messaging/Voice/Data service charging or any other financial settlement related to the use of the service. 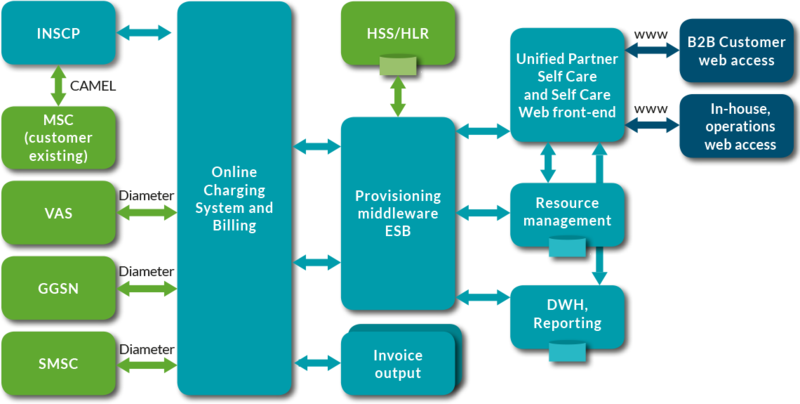 In order to provide efficient accounts management, service fulfillment and billing, the system exposes Web based front-end. It enables multi-tenant customer structure based operations for various kinds of services. Login to the specific context of the customer/tenant Platform that supports multi-tenant data structures. It enables separation of customers, contracts, devices and resources. Search/select/create customers, accounts, contracts, subscriptions, and products. View contract usage data and invoices. Run reports (a set of standard reports is included). The solution provides an interface for integration with back office. There are several modules around the Provisioning system core: Provisioning Client, Batch Provisioning, External Provisioning Gateway. The resource management module keeps track of resources in the whole BOSS environment. It provides: Resource database containing resources (simcards, imsis, msisdns, batch), SIMCard Loader and Resource Management GUI. For data mining and DWH purposes, the platform provides the CDR and invoice feed. Files are stored in the local file system with indexed names. For that purpose, CDR data files need to be picked up to avoid overwriting. The FTP service is setup to allow file collection by DWH platform. Alternatively, invoices can be sent to print house or email delivery processor. As an additional component Arevocom can deploy a customized set of reports available via the Web application to be downloaded for further post-processing and business analytics purposes.